First I want to pass along the fact that next Tuesday, August 25th, is the NPS’s birthday. The good news is that all national park entrance fees will be waived that day. So, if you have time to visit a park that’s not too far from you and can stay only one day, that would be a good day to go. Next, I hope many people who normally read my blog posts have been visiting Yellowstone or another park this month, since there’s been nothing new to read on this website since August first. Editor Beth has been both flying and sailing (but not in Yellowstone), while author Janet has stayed earthbound and had time to catch up on work that needs doing for her next Yellowstone book. This new book will be a historical anthology full of good things to read and look at. So I’m celebrating the NPS birthday by beginning to reveal bit by bit what’s in my new book as we approach next spring’s publication date. I’ve mentioned the upcoming book twice before on my blog; on October 6, 2014, and March 3, 2015, I was calling it Magnificent Playground: Early Yellowstone in Words and Watercolors, but now we’ve decided on a title that gives a better idea of what’s in the book. Through Early Yellowstone: Adventuring by Bicycle, Covered Wagon, Foot, Horseback, and Skis offers a potpourri of historical articles that are both important to Yellowstone history and fun to read. There are ten major stories in this book but also several short selections—what I call snippets of information and historical ambience. 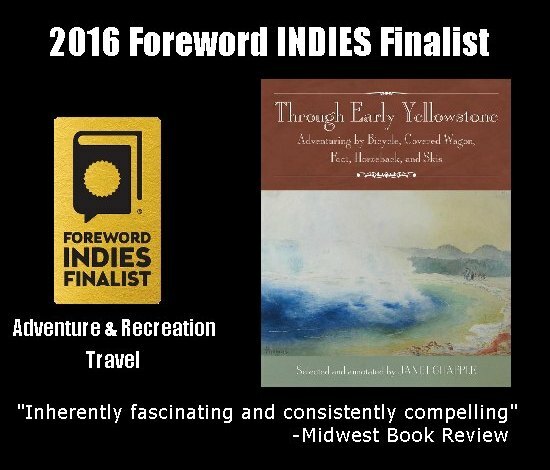 All will give readers a feeling for the gradual change in the ways of enjoying, using, and also studying the world’s first national park. The selections span the time between establishment of Yellowstone National Park in 1872 and the country’s entry into World War One. I’ll let you know as the months go by more about what Through Early Yellowstone contains, but today I want to tell you about one of the amazing people we feature who have contributed to the park’s history. Here’s the headline of a one-page article, in which the editors saw fit to honor a woman resident of New York City who was an avid horsewoman. In the early 1900s Mrs. Robert C. Morris (Alice Parmelee Morris) had become enamored with the scenery of Yellowstone Park and spent many summers at the Silver Tip Ranch just north of the park. Then in 1917 Mrs. Morris conceived, financed, and carried out her remarkable plan to explore and map an interconnected loop of trails throughout the park and its environs. At that time Yellowstone Park trails totaled about 400 miles—but not all were suitable for equestrian traffic. Mrs. Morris spent four summer months leading her pack train throughout the park. She presented a twenty-nine-page typed report, “Notes on Trail Study in Yellowstone Park 1917,” to Park Supervisor Chester A. Lindsley. Included with the report was a detailed and professionally produced map showing the proposed trails, which we will reproduce along with the New York Times article in the anthology. So what became of this report that Mrs. Morris worked out so carefully? No evidence of action taken on her work turns up in a search of Yellowstone Park archives. One can speculate, however, that there could have been several reasons for this. 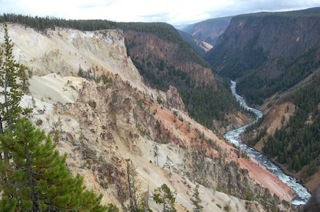 First, lack of funds: a request to Congress for $50,000 for a system of trails and bridle paths in Yellowstone went nowhere. This is not surprising—the bill was submitted on the exact date of President Woodrow Wilson’s request to Congress for a declaration of war with Germany: April 2, 1917. Second, administrative turmoil between the National Park Service and Yellowstone: in 1917 and 1918 there was disagreement as to which agency was in charge of roads and trails, since the NPS (created in 1916) was gradually replacing the U.S. Army Corps of Engineers for such construction projects. Third, low priority: automobiles had almost completely replaced horses in the park. In 1918, for example, among the park’s 35,039 tourists, only 808 came in horse-drawn vehicles. The number of people who came on horseback is not recorded but must have been very small. Fourth, two other Yellowstone enthusiasts contributed their own plans to the park administration: long-time park employee Milton P. Skinner and pack-trip leader Howard Eaton had both worked on the question of improving the trails, and both submitted plans. Mrs. Morris’s plan was scarcely acknowledged. Some money must have been found for trails after the war, however, since in 1923 a complete system of trails was dedicated to Howard Eaton.